To give your content a sufficient touch people creates PowerPoint presentations to provide some extra information to their readers. 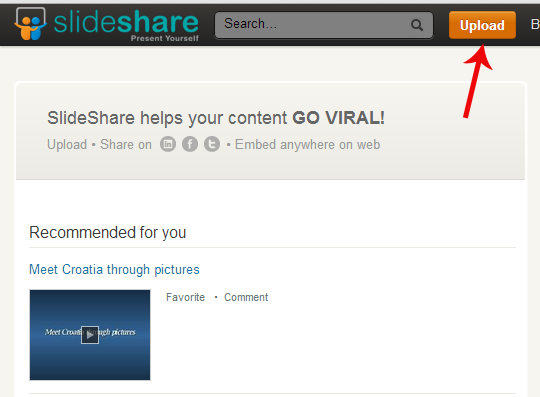 You usually upload your PowerPoint presentations to SlideShare, and want to embed them onto your website? 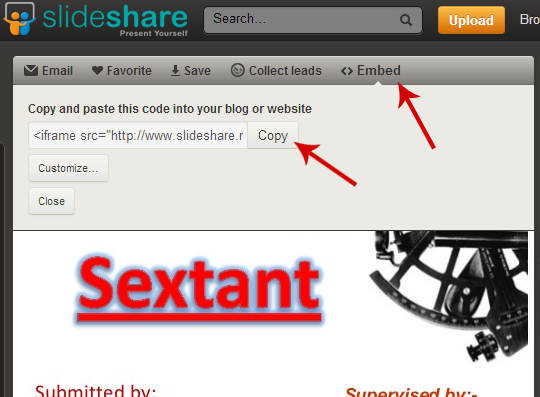 That is quite straightforward – just grab an embed code from SlideShare.net and paste it anywhere in your website, but How to do that? 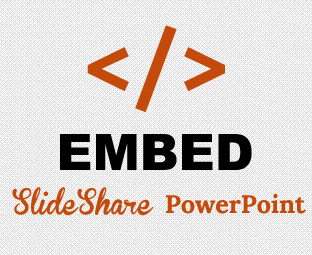 If you are also looking for a method to Embed Slideshare.net presentation onto your Blogger Enable website then, today in this article, we will show you How to Embed SlideShare PowerPoint Presentation in Blogger. 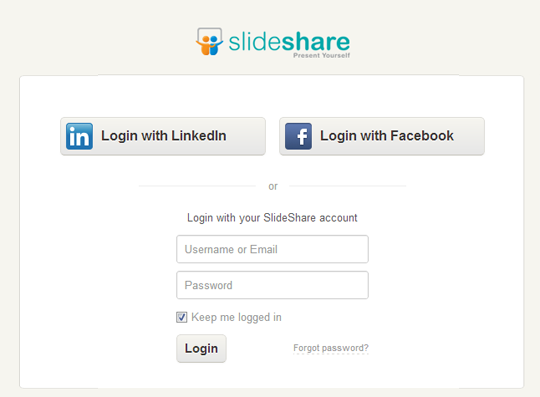 First of all, Login to your SlideShare Account but in case if you do not have an account then register a new one. 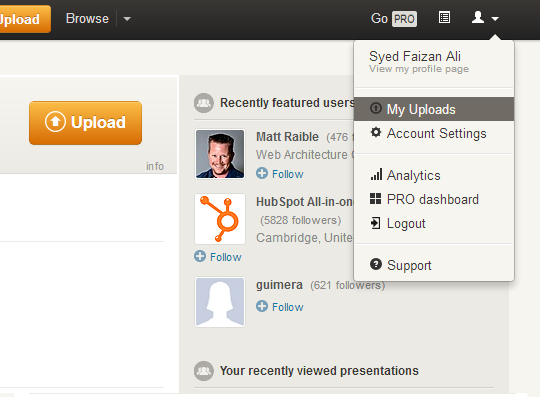 However, if you have a Facebook Account, then you can simply connect it with SlideShare. Now hit the orange “Upload” button and upload your PowerPoint presentation. It will take few seconds to upload your depends upon the speed of your internet connection. After uploading, open the presentation that you uploaded. You can access your old/new PowerPoint slides from the “My Uploads” menu. On the top of the Slides, there is an option Called “Embed”. Select the Embed Tab and, it will provide you an HTML Code. This is the code which will help you in embedding these slides on your site. Just Press the “Copy” button to copy all the HTML code. 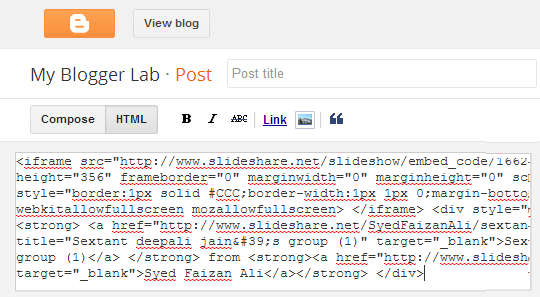 After copying the code, go to Blogger.com >> Add a new Post >> select the Edit HTML Tab and paste the code in the HTML Text box which you copied in the previous step. Give it a Post Title, and Hit the Publish Button. Does it Works on Flash? The whole thing works on Flash, so those who get their majority of visits from such browsers which do not support flash then they should not use this functionality. To track your visitor’s browsers, you can off course use Google Analytics. Does it slow down a Website? No, it would not slowdown your website’s load time. Since, the slides are not hosted at your site. Therefore, your site would loads rapidly without any lapse or bug. I try it and sometimes it work sometimes it doesn't. Maybe I did something wrong. Thank you for the post. Working , Thanks For The Info..